The Palo Alto Daily Post, a free print-only publication than never misses a muckraking opportunity to drum up advertising dollars, is stepping up its HSR fear-mongering another notch. Just like it did one year ago, the Post headline blares: It's Trains Or the Tree. Fast rail will doom fabled redwood. That's right, 1070-year-old El Palo Alto, California Historical Landmark No. 2, is on the chopping block again. Palo Alto arborist Dave Dockter is quoted as saying "The best scenario for the tree would be no rail project. The second best would be to tunnel way down deep under the tree so as to not mess up its roots and the hydrology, but there couldn't be an above-ground scenario near the tree; that would be catastrophic." The rest of the article suggests that Dockter may have been shanghaied into this sensational story. He goes on to say that if anything can be done to save the tree, it will have to spring from a determined joint effort between rail officials and tree experts. "All the nation's best arborists and engineers would have to come around that tree and be on the same side, not as an adversarial relationship, but as an engineering challenge. Engineering needs to meld with nature." This provides yet another reason for the project to hire an arborist. If Dockter had a counterpart, he might not be so inclined to let the Daily Post to stir the HSR pot. In the meantime, there can be little doubt that engineers and arborists will eventually see to it that El Palo Alto is safe. Tim Cobb, whose firm HNTB is performing engineering work for the Peninsula segment, said the alternatives analysis is also considering stacking train tracks in sets of two. This could entail keeping the two existing Caltrain tracks in their current alignment and building two new high-speed-rail tracks either above or below them. This appears to be a particularly viable option at areas where the right-of-ways are narrow, such as Churchill Avenue, rail officials said. Track stacking is a design that communities should beware. 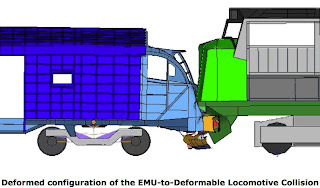 While it may solve the problem of threading four tracks through narrow right-of-way pinch points without taking adjacent properties, it has many disadvantages. 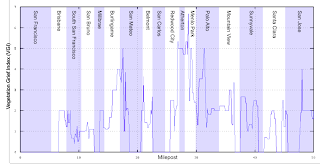 If the tracks are stacked, one pair of tracks (Caltrain's) will remain at grade. This will result in continued noise from grade crossing bells and train horns (especially from freight trains, which will operate between midnight and 5 AM), and continued accidents and service disruptions caused by the occasional trespasser or stalled car. The impact will only get worse as Caltrain traffic increases from the current 90 trains/weekday. Grade separations can provide important community benefits such as reduced noise, smoothed traffic flows across the tracks, and a safer environment with a lower risk of accidents. Track stacking not only precludes these benefits, but it permanently prevents the future grade separation of Caltrain. 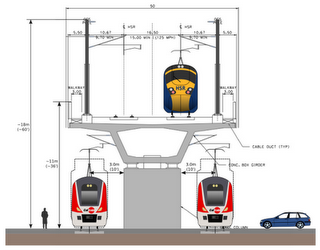 If the HSR tracks are stacked above the Caltrain tracks, they will need to clear tall freight trains and high-voltage overhead electrification. That means the free clearance underneath such a structure must be ~25 feet, with the HSR tracks ~30 feet above ground level rather than ~16 feet for a conventional overpass grade separation. Sound walls and overhead electrification poles would raise the overall height of such a viaduct to a neighborhood-blighting sixty feet (as shown in the figure above, with a viaduct taken from TM 1.1.21). The noise and visual impact could spread far beyond the immediate vicinity of the crossing, affecting several blocks on either side of the tracks. If the tracks are sunk, all the surface disruption and expense of tunnel construction will be incurred with none of the benefits. After the dust settles, trains will still make noise, grade crossings will still close a hundred times a day, the tracks will still form a barrier through the community, and crossing accidents will still occur. The tunnel plus at-grade solution is now favored in Anaheim, where there is a 1.5-mile stretch of 50-foot right of way, far narrower than anywhere on the peninsula. Building stacked tracks will require land takes anyway, since stacked tracks cannot be built directly over or under active Caltrain tracks. Any stacked scenario would require temporary shoofly tracks to keep Caltrain operating during construction, and those shoofly tracks might require the very same land takes that stacked arrangements are intended to avoid in the first place. Whether temporary (for construction) or permanent, such land takes have the same legal and material impacts to residents. Stacked tracks are a waste of taxpayer money. For roughly the same cost and the same level of disruption, a simpler and functionally more effective four-track grade separation can be built instead. The only people who benefit from the tens of millions of dollars spent to stack the tracks are (a) the engineering and construction firms who build these complex structures, and (b) a handful of property owners immediately adjacent to the tracks, who get to hang on to their land in somewhat of a Pyrrhic victory. One might reasonably conclude that stacked tracks are a badly overwrought solution to the perceived problem of residential takes. Taken for granted in this crazy talk about stacked tracks is an assumption that a 100-foot wide swath is required if all four tracks run on the same level. That 100-foot peg won't fit in some of the 60 or 75-foot holes that dot the peninsula corridor. As it turns out, this 100-foot figure includes expansive margins for cable ducts, utility easements, maintenance walkways and drainage structures. In a pinch, the tracks can be spaced just 15 feet center-to-center. So are we going to build a 60-foot tall structure just so drainage trenches will fit and AT&T can run some fiber optic cable on the right of way? No, we shouldn't. With some creative engineering, four tracks can and do exceptionally fit within a 75-foot right of way, even with drainage and utilities. It makes no sense to build tall viaducts or tunnels because we're short a few feet for these ancillary items. Which brings us to land takes, a.k.a. eminent domain... the third rail of peninsula HSR politics. With growing opposition to HSR on the peninsula, program managers are walking on eggshells, especially when it comes to taking any residential land. What they fear most in eminent domain proceedings is neither cost nor delay (both would likely be minimal), but the political fallout and galvanized opposition to the project. Seemingly bending over backwards to avoid residential land takes at all possible costs, HSR designers are now contorting themselves into these stacked design alternatives possibly as a veiled signal to the communities. Perhaps it is their calculation to elicit such a negative response that the communities themselves will suggest far more reasonable solutions--solutions that may involve a residential take here and there. Whatever the underlying motives might be, peninsula cities should be suspicious of stacked tracks, and weigh the relative community benefits of carefully optimized and very limited residential takes. And communities will need to take the initiative on this, because the HSR project politically can't and won't. In some cases, eminent domain is not just a last resort: it may be part of the "best" and overall lowest-impact design solution. There are an estimated 19,250 trees adjacent to the Caltrain right of way between San Francisco and Gilroy. Approximately 1,727 trees (9% of the total) would be impacted by the two-track electrification project. The tree survey includes a detailed tree-by-tree assessment of some of the densest tree canopies along the rail corridor, such as Atherton and Burlingame. It also includes a mile-by-mile summary of vegetation intensity on each side of the corridor, graphed in the figure at right. 1 = generally clear, 2 = scattered or intermittent, and 3 = dense with long stretches of continuous canopy. How does the situation change with four electrified tracks? While the corridor generally provides sufficient space for four tracks, many more trees would be impacted because electrified tracks would be moved closer to the edges of the right-of-way than envisioned in the tree survey, which only studied impacts from electrification of the two existing tracks. One would expect many more trees to be impacted by the proximity of high voltage wires. 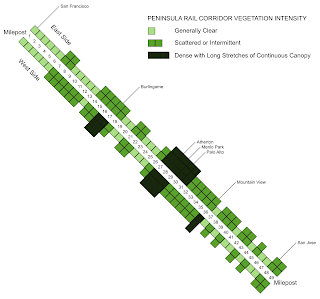 One possible way to quantify the relative HSR impacts to trees along the rail corridor is to combine the vegetation intensity index with the corridor width from San Francisco to San Jose. It's an interesting exercise because more trees will be impacted where the corridor is narrow. Take the sum of the vegetation intensity on both sides of the corridor, subtract two (so that we don't count "generally clear" areas), and simply divide by the width of the corridor. This is the formula for a Vegetation Grief Index (VGI), which is highest when the corridor is narrow and the vegetation is dense. The result is shown at left. Interestingly, the VGI exceeds 3 in those communities (such as Burlingame, Atherton, Menlo Park and Palo Alto) that are the most worried about the HSR project and have formed the Peninsula Cities Consortium to advocate for their concerns. More generally speaking, the VGI seems to be an excellent predictor of anti-HSR sentiment among residents. That might suggest that a key position is missing from the Peninsula Rail Program: a full-time certified arborist.